I have made one of these so consider it verified. Socketed the input cap and tried different values from 100n to 200n, seems to change the character a lot. I stuck at 200n and I'm running very hot humbuckers on a dark sounding guitar with a warm solid state amp. I have a dod punkifier on my board and I get very similar sounds with that, it may get replaced by this though as it seems more responsive to the strings and you can dial in some clean guitar if you fiddle around. Is an IC LM386 good too ? I can't find NJM386 in my town. Thanx a lot for all that work ! It's work very well with LM386 ! Could you find layout for the LowFuzz Penny Pedals ? I have a problem when I put board in the enclure. It's sounds not. But when I take jacks out from the enclosure it's good ! I think it's a ground problem but I have no idea to wiring it correctly. Have you wired it like this? No. My switches are dpdt ( 6 pins). -Input is stereo jack - output is mono jack. -Shields are connected between, with grounds too. -Switch 3 and 6 are linked together. The Dc is metal. Maybe use a plastic dc. ? Yes if the DC socket is metal then with a negative centre pin it takes 9V to the case. You can only use those adapters with plastic boxes or with a positive centre pin. I can choose positive or negative center pin. But it don't works in the enclosure. It works only with jacks or dc out from the enclosure with a negative centre pin adaptators. Maybe stupid but .. reverse the connections of the red and black dc socket? Yes, but you'll also have to change the polarity of the plug, if you're using a standard effect power supply then the plug the supply is coming from will be negative centre. would https://www.mammothelectronics.com/ProductDetails.asp?ProductCode=120-1024 be apropriate for diode 4? should Gain 1 and texture 1 be grounded? or just not connected to anything? IS the NJm386 directional? can I put it in backwards? No, those pots are just used as variable resistors so lugs 1 are unconnected. Note for other newbies that might be having issue. The NJM386 is directional Pin 1 will be marked with a small circle over it and should be in the top left hand corner on this layout. I now have this working! 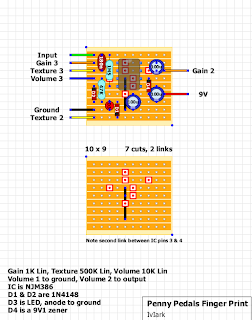 How do you wire a footswitch to switch between full gain and the gain pot? Connecting Gain 2 to Gain 3 will make it maximum gain, so just use one contact on a second stomp switch to make and break that connection. how this connection should be connected? Just connect Gain 2 to 1 and Gain 3 to 2. That's it. I made one of these last night, i found the texture knob seems to gate the sound somewhat. Generally a nice sounding fuzz, a bit different to the usual, quite dynamic too. Been playing around with this a bit more, i think it may end up on ebay, just seems a little boring. Sound of this pedal is not distortion, this is real fuzz! I recently saw a fingerprint with a boost. Is there way to add to the diagram? It would be really fun! I saw here: http://revolutiondeux.blogspot.be/2012/01/penny-pedals-fingerprint.html Also, in the diagram there is a LED "blue clear superbright" and the texture pot is C500K. Do you have a comment on that? having a "C" pot instead of a "B" will just change the taper of that pot some, and the blue LED will probably change the distortion characteristics a bit (if compared to a red, per example), it can be quite subtle... best thing you do is to use a socket and try different colors! Thanks! it's a good idea! Any idea for this version with boost ? I think its not a boost but it switches to full gain. There's a comment above that describes this. 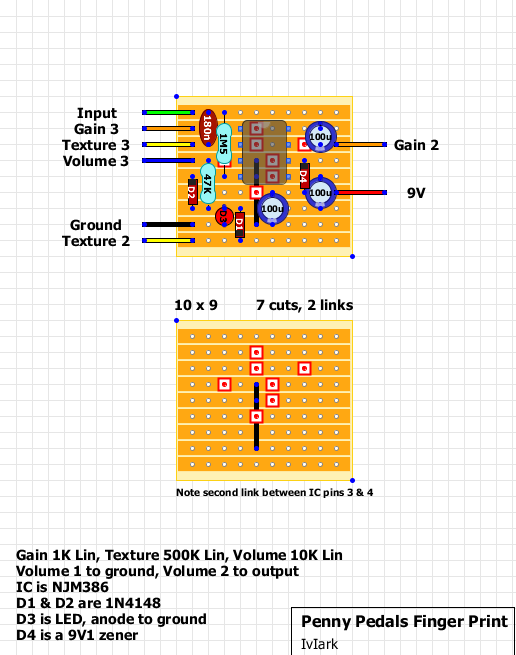 I tried this but instead it went from gain (pot) to no gain (probably I wired it wrong). But I liked it because now it acts as a fat boost in the "no gain" position, so I didn't try to change it. I've been thinking about building another one of these, and I noticed something. There seems to be some differences between your layout and the culturejam schematic of this pedal. Which schem did you draw this one from? Does anyone know how to mod this to the noir dark fuzz version? I can't seem to find a way to add a tone pot and do not know what cap to change to darken it up. ANy help is greatly appreciated. Thank you!